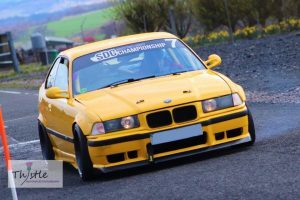 The second round of the all new Scottish Road Car Series came to a close on Saturday afternoon at Knockhill and now that the excitement is over, we have time to reflect on what has been a strong start to the series. 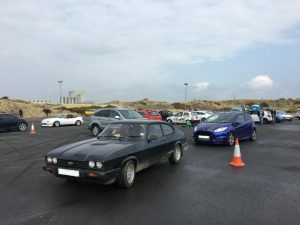 The first round, run by Scottish Sporting Car Club, took place on 14 April at Ardeer in the grounds surrounding the old Nobel factory which, interestingly, is where the world’s first explosives were produced back in the late 1800s. Thankfully there was no dynamite at Ardeer on the 14th although there was some explosive pace demonstrated at the front of the 11 car strong SRCS field! 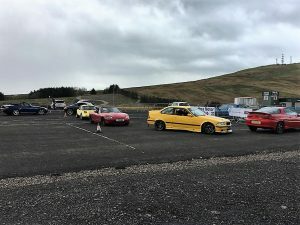 The course layouts from Scottish Sporting Car Club were tight and challenging for the drivers and rewarded precision and a nimble handling car. 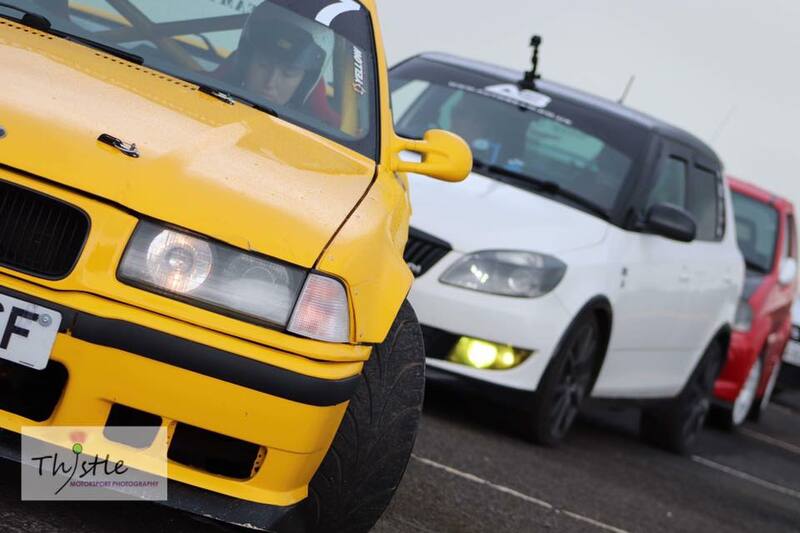 At the end of the day, it was Bob Mather who came out on top in his Renault Clio that he shared with 3rd placed finisher Dominic Shanahan. Ryan Gardiner took a close 2nd place in his Mazda Mx5. 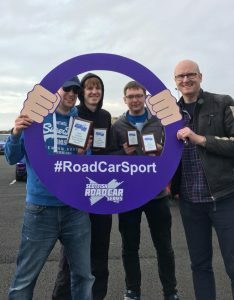 Craig Neil was awarded the ‘SRCS driver of the day’ award for his efforts hustling his big SEAT Cupra Estate car around the course and Lauren Austen-Maycock was also awarded a special chocolate prize for efforts travelling over 4 hours from Fraserburgh to compete her Mazda MX3 in the event! 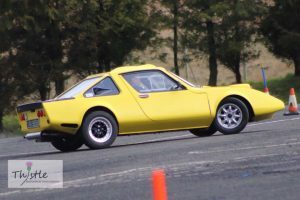 It was great see such a variety of cars fielded for round 1, from Douglas McDougall’s Porsche Caymen to Mathew Walker’s Ford Capris and Mark Cuthbert’s Ford Fiesta ST. 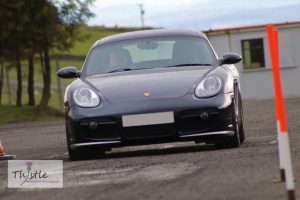 Despite this variety, the smiles at the end of the day proved that you really can enjoy the competition regardless of whether you are in a brand new sports car or an old family saloon car! 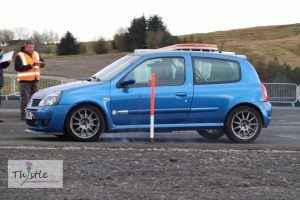 Round 2 of the series took place at Knockhill on 28 April, where quite a different challenge awaited the competitors. 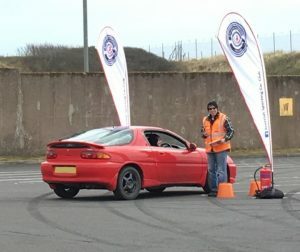 Where Ardeer was tight and technical, the courses set out by Glenrothes Motor Sports Club were fast and flowing. This coupled with changing weather conditions (sun, rain and hail all in the space of a few hours!) made for a real challenge and saw multiple drivers have some minor excursions in their efforts to muscle their cars around the course. The event attracted a great entry with 18 competitors, many of whom had competed in round 1 at Ardeer as well. 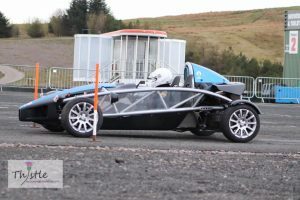 Again there was a great variety of cars present at this event which attracted some more raw machinery such as Taimur Shoaib’s Caterham and Michael McAlinden’s Ariel Atom! There were also some more classic entries as well from Alasdair Tannock’s mini and Scott Clements exuberantly driven Clan Crusader. The top three drivers from round 1 were back again to defend the top spots but it was Drifter and Gymkhana competitor, Steven McConnell who made a mark in his first road car series event to take the win in his BMW 328. Andrew Park took 2nd place in his Honda S2000 and Dominic Shanahan equalled his round 1 result with a fantastic 3rd place finish. 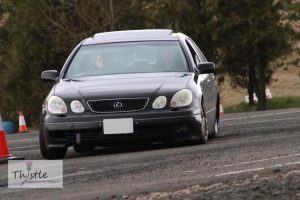 Driver of the day went to Liam Hughes in his Lexus GS300. The results after round 2 still see Bob Mather leading the series with Dominic Shanahan hot on his heels in second. However, there is a long way to go and with only drivers 5 best results counting towards the end of season points, there are still plenty of opportunities for others to challenge for the top spots, especially with a range of different venues coming up in the calendar that will play to different car and driver strengths. All in all, with 22 drivers registered for the series so far, it has been a successful start to the season. Next we head North to Boyndie Kart Track, which will be the first round of the year to be run on a circuit – expect some fast and flowing courses and lots of action!